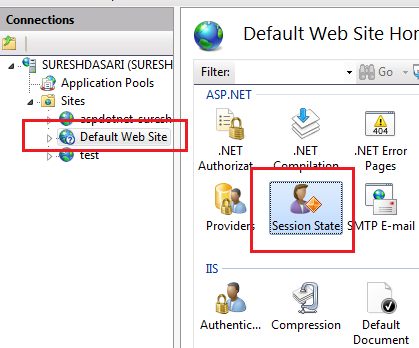 Here I will explain how to set session timeout in web.config,IIS and in application using asp.net manually. 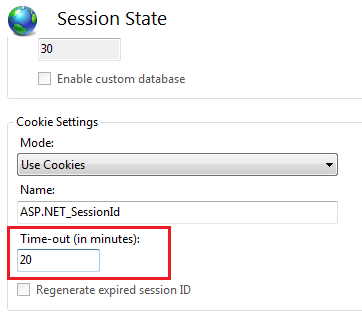 In IIS setting you can also set default session timeout. 1) Open IIS start-->run type-->inetmgr and press enter. This code need some correction. Note; closing tag and white space at timeout was the problem. Plz give me the sample asax file for start the session and stop the session. plse reply me the answer. It will be 30 mins of iis or 60 mins of web.config. here post state that iis setting time is used that is 20 mins not web.config. ( Means iis always replace web.config time out). but some of the post are saying that it will work reverse. Means web.config timeout will be used instead of iis. how to configure session state..? Sir, I want to override the session timeout duration of iis server . How i can override iis session duration by c# code?